A 48-seater European built ATR 42-500 aircraft arrived on June 4 as the third aircraft of Bhutan’s national airline Drukair. The leased aircraft will be operating between Kolkata, India and Kathmandu, Nepal daily. Drukair is expecting to save some operation cost with this smaller aircraft. Although the department of civil aviation has not cleared the aircraft to operate domestically, Drukair also expects the operate the aircraft on the domestic sector. If the aircraft is passed Drukair will operate domestic flights before 9 am. Even with this additional aircraft Drukair is still short of an aircraft to expand its network to Hong Kong, Singapore, Mumbai and Bangalore. The airline is expecting its fourth aircraft next year. 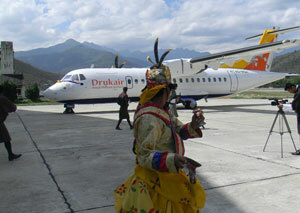 Drukair is the only airline in Bhutan.